In-depth and thorough examination of AMD64 architecture / Appendix 1. The need in this material arose because AMD documents are too concise and inconsistent. The respective sections are taken from older Athlon manuals with minimal changes with K8 bus width left untouched. In order to do this, let's create a dependent chain (or a singly linked list in terms of C) in a fixed RAM array (block). Each array element contains an address of another element (a pointer in terms of C), and the address chain is designed so that if we move from the first element, we'll traverse all other once to return to the first one again. Sequential access - 1st, 2nd, 3rd, etc. until the last, then again 1st, etc. Random access - random traversal with each element passed strictly once. Now if we measure the chain traversal time and divide it by the element number, we'll obtain the average load-use latency. To get the CPU cache access latency we should equalize the array element size with the cache string size, i.e. 64 bytes (then a single element access will mean a single string access), and also make the array smaller than or equal to cache. Then after the first several traversals the entire array will fit into cache, so during the precise time measurements data will be loaded from cache only. Thus in case of Opteron <64Kb chain traversal will provide L1 latency, while 96-1088 Kb chain traversal will provide L2 latency. In the table below you can see the results in clocks for K7/K8 architectures and different arrays. The first value stands for the sequential access, the second - for random. You can see that L1 latency is 3 clocks, while L2 latency for this chain is higher than 11 clocks provided in AMD documents. Let's suppose that latency increases because load and evict stages overlap. We'll try to shed more light on this in the next test. It's also evident that sequential latency is higher than random in case of Athlon XP, in particular, it's 24 clocks higher than provided for maximum latency (20 clocks). These additional 4 clocks are required for hardware prefetch that operates in case of the sequential access. Not to clutter up results with these resource expenses (that are required in seldom cases of strong bus load), further we'll provide random access results if not stated otherwise. To avoid overlapping of load and evict stages, let's add instructions not related to cache access, but injecting pauses between adjacent instructions. Let's call these nops for short. In K7/K8 architectures each nop instruction like "add eax,edx" will be pausing the chain execution by a single clock. So now to obtain the correct latency value we'll have to subtract nop amount from the average access time. L1 cache latency remained the same 3 clocks. But L2 latency became the promised 11 clocks (for 112Kb block; 9, 10 nop; >24 nops). For bigger blocks this number increases only by 2 clocks related to L1D TLB cache limits that's enough for 128Kb random access (32 strings) only. In real apps with higher data locality (within 4K virtual memory pages) this effect won't be strong, so the 112K block is indicative enough. However, we believe the most interesting result is the graph behavior - regular, but with occasional jumps to 25 latency clocks. In the future we'll try to explain this. Well, the general latency picture has changed significantly in K8. It's nice that values have reduced almost for every case. We believe that K7's L2 latency increase is related to the limited L1-L2 bus bandwidth. If it's so, than the bandwidth have increased. For more details on this see the next section. And here, you can finally see the K8 latency graph for a dependent chain and different block size and access modes (Rnd - random, Seq - sequential). 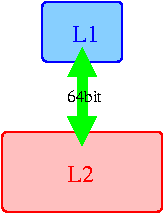 You can see that K7's access to L2 is limited by L1-L2 bandwidth of 6.4 bytes/clock that fully corresponds to a single duplex bus 64-bit wide (considering turnaround losses, 6.4 = (64+64) / (8+2+8+2)). At the same time K8 doesn't have this limit, so in our case it provides 10 bytes/clock bandwidth. As the bandwidth stays high up to L2+L1D block size (1088K = 1M + 64K), the cache exclusiveness should be considered proven. (In this parenthesis we must mention that you won't see such indicative graph for sequential access. The reason is insufficient L2 associativity (even 16 sets are not enough for 1M cache already). Perhaps, in the future we'll try to estimate other effects this fact might have). 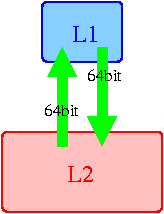 Exactly here you can note the maximum L1-L2 difference between K7 and K8 architectures. The bandwidth has grown almost twice, up to 12 bytes/clock. Of course, it would be impossible to pump that much data through the old 64-bit bus in a single clock. It should now be clear that effective bus width of K8 architecture is 128 bit. And the bus design itself is described in the next section. To understand if the middle variant is correct, let's change our dependent chain method again to consider a single chain as we have done before. If you remember, each chain element was to be passed only once each chain traversal (element size = 64 bytes = cache string size). At that each clock we were reading a single 4-byte word with 0 offset from the element beginning. Now in each element we'll be reading words with O1 offset first and words with O2 offset inside the element next. And now let's look at latency results for loading two words located in the same string depending on the relative offset (offset = O2 - O1) in this string. At that nops = 64 and sync-nop amount was chosen to minimize the average latency. On the graph below you can see latency in clocks for the 1st word and 2nd word as well as the delay between. Also note that in this test all K7/Palomino and K8 results have turned out to be identical. Besides, they haven't depended on 1st word's O1 offset in the string (at that the relative offset is chosen considering the string size). The last test results prove that the read width of L1-L2 bus is 64-bit. Considering the results from the previous section, where we proved that effective width of L1-L2 bus in K8 architecture is 128 bits, which means the remaining 64 bits are used for evict operations. Therefore the correct bus variant is shown on the right. K7/K8 has rather perfect L1/L2 cache architecture, so changes described above should be enough for Opterons to compete with other processors for several years more. The absence of fundamental changes in L2 cache access engine negates the benefit of its considerable size (1M) in many respects, so perhaps, AMD will have to implement more significant changes in the next core revisions.